Bridge approach settlement and the formation of the bump is a common problem in Iowa that draws upon considerable resources for maintenance and creates a negative perception in the minds of transportation users. This research study was undertaken to investigate bridge approach problems and develop new concepts for design, construction, and maintenance that will reduce this costly problem. As a result of the research described in this report, the following changes are suggested for implementation on a pilot test basis: Use porous backfill behind the abutment and/or geocomposite drainage systems to improve drainage capacity and reduce erosion around the abutment. On a pilot basis, connect the approach slab to the bridge abutment. 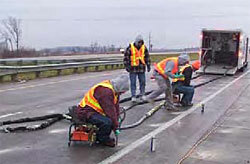 Change the expansion joint at the bridge to a construction joint of 2 inch. Use a more effective joint sealing system at the CF joint. Change the abutment wall rebar from #5 to #7 for non-integral abutments. For bridges with soft foundation or embankment soils, implement practices of better compaction, preloading, ground improvement, soil removal and replacement, or soil reinforcement that reduce time-dependent post construction settlements.